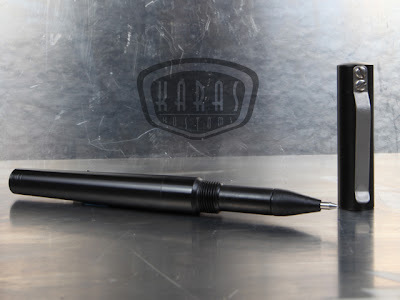 Karas Pen Company: Special RENDER K Versions. When we started production on the RENDER K, we experimented with a few variations on the original, including various materials and finishes. We only made a few of each type and most likely will not be making them again (unless we get many requests to do so). So we are offering these low run versions of the RENDER K for sale to those who may be interested. These are limited in number so when they are gone, they are gone. This is a black Delrin version of the RENDER K. The only metal parts on the pen are the clip and screws. There may be slight imperfections on the barrel and cap from the machining process. This makes every one a little different. If this bothers you, please don't purchase this pen and expect it to be perfect. Refills in the photo are for illustrative purposes and do not come with the pen. Works with the Pilot Hi-Tec-C and Parker ballpoint compatible refills. 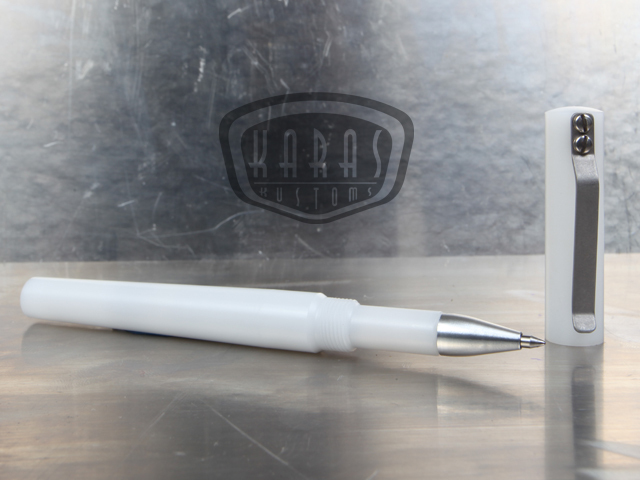 This is a white (natural) Delrin version of the RENDER K. The thinner sections of the pen are slightly transparent. If you put a brightly colored refill into the pen, you will be able to slightly see the color. 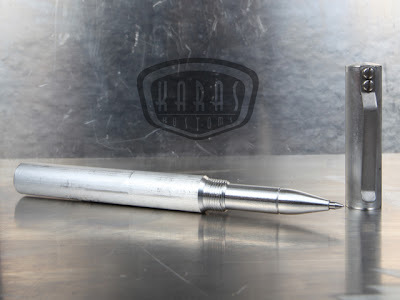 The only metal parts on the pen are the clip and screws and an aluminum pen tip. There may be slight imperfections on the barrel and cap from the machining process. This makes every one a little different. If this bothers you, please don't purchase this pen and expect it to be perfect. Refills in the photo are for illustrative purposes and do not come with the pen. Works with the Pilot Hi-Tec-C and Parker ballpoint compatible refills. 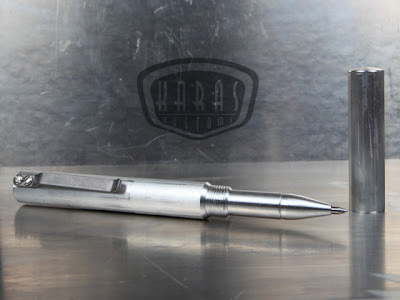 This is a raw bar-stock version of the RENDER K. The only machined areas of the pen are the ends and the area forward of the threads on the pen body. The raw bar stock will have imperfections, scuffs and dings. There are going to be imperfections on the barrel and cap from the machining process where the material was held in the lathe. This makes every one a little different. If this bothers you, please don't purchase this pen and expect it to be perfect. Refills in the photo are for illustrative purposes and do not come with the pen. Works with the Pilot Hi-Tec-C and Parker ballpoint compatible refills. This version is now available on our website. Click here. 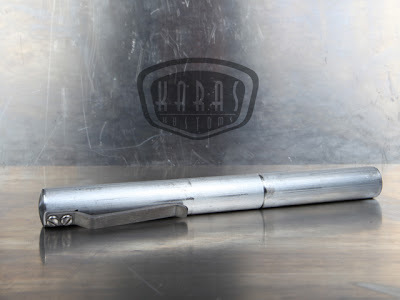 This is a variation on the raw bar-stock version of the RENDER K. Instead of the clip being installed on the pen cap, the clip is installed on the body of the pen. 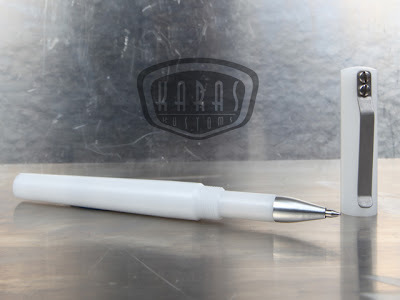 This way the weight of the pen is supported by the body of the pen, instead of the cap, which can unscrew more easily with the extra weight. The only machined areas of the pen are the ends and the area forward of the threads on the pen body. The raw bar stock will have imperfections, scuffs and dings. There are going to be imperfections on the barrel and cap from the machining process where the material was held in the lathe. This makes every one a little different. If this bothers you, please don't purchase this pen and expect it to be perfect. Refills in the photo are for illustrative purposes and do not come with the pen. 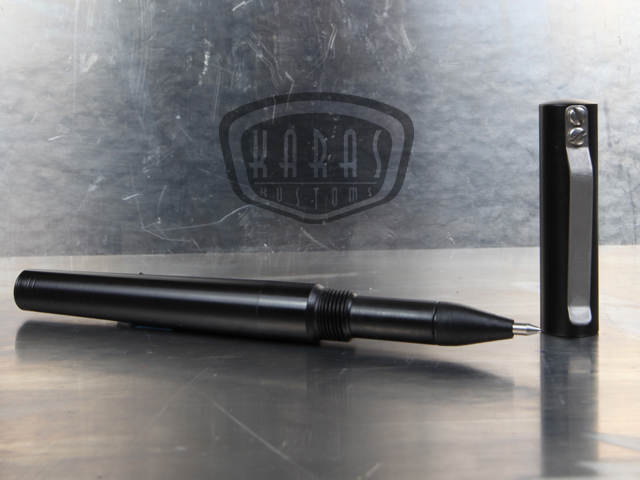 Works with the Pilot Hi-Tec-C and Parker ballpoint compatible refills. Very neat idea, giving backers the opportunity to buy prototypes. I would kind of like to get the black one, but since it's not metal, I'll pass. Maybe at a cheaper price, I don't know. Great job on the Render K. I use it everyday. I would love a brass version of the Raw Bar-Stock RENDER K if at all possible! Loving the Flip Flop Raw Bar-Stock version -- same badass feel and this one doesn't roll off my desk when it's uncapped.